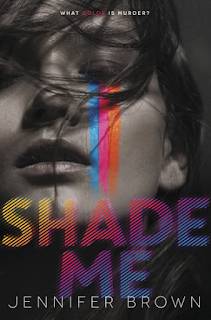 The Page 69 Test: "Shade Me"
Jennifer Brown's books include the YA novels Hate List, Bitter End, Perfect Escape, Thousand Words, and Torn Away, and the middle grade novels Life on Mars and How Lunchbox Jones Saved Me From Robots, Traitors, and Missy the Cruel. But before I could open my mouth, Dru answered for me. “A friend of Peyton’s.” I gave him a curious look. Why the lie? But I guessed maybe I knew why. Bill Hollis was not in a mood for games—and who could blame him?—and he might consider it a game for someone who wasn’t exactly a friend to be there. Fern green feathered in around us, giving me an itchy feeling I always got in awkward situations. I stared at it, unsure what to do, my head shaking of its own accord. Bill Hollis was probably not the kind of guy whose handshakes went unreciprocated, but something about him oozed minty distrust that made my heart pound, even more so than with Dru. I was too scared of him to touch him. Nikki Kill is not your typical sleuth. Or your typical Hollywood teen. Or your typical anything, really. She is a semi-surly ripped-jeans-and-scuffed-Chucks-clad girl struggling with her grades, her mom’s death, and her synesthesia. Nikki sees colors in words, letters, numbers, and even emotions, which makes her world a confusing, and frustrating, place. But Nikki is forced into solving a dangerous mystery when Peyton Hollis, a very rich, very popular girl from her school, is attacked, and Nikki’s is the only number stored in Peyton’s phone. Nikki has never so much as spoken to Peyton in her life, and doesn’t want to solve the mystery of who left Peyton for dead, but she is quickly sucked in by curiosity, a sense of obligation, and a dismaying attraction to Peyton’s brother, Dru. On page 69, Nikki is visiting Peyton at the hospital, wrestling with the irresistible pull of Dru, when Peyton’s wealthy and powerful movie producer father, Bill Hollis, arrives. This is Nikki’s first (but definitely not last!) run-in with the frightening elder Hollis, and she finds herself instantly battling the heebie-jeebies. She feels defensive and suspicious and can’t help wondering why Dru is lying about who she is. Is he protecting her? Is he protecting Peyton? Is he protecting the family? Or is he simply protecting himself? While not exactly a pivotal scene in Shade Me, this scene is still important, as it marks the deepening of Nikki’s dedication to the case. What she sees in Bill Hollis makes her wonder what has really gone on in Peyton’s life. She begins to believe that maybe Peyton did need help. And she is determined to find out…why did Peyton need help from her? My Book, The Movie: Life on Mars.